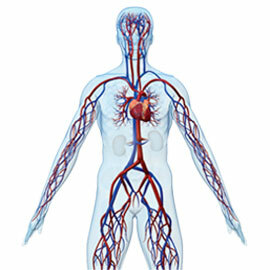 The vascular system is the network of blood vessels that circulate blood to and from the heart and lungs. The circulatory system (made up of the heart, arteries, veins, capillaries, and the circulating blood) provides nourishment to the body’s cells and removes their waste. The arteries carry oxygenated blood from the heart to the cells. The veins return the blood from the cells back to the lungs for reoxygenation and recirculation by the heart. The aorta is the largest artery leaving the heart; it then subdivides into smaller arteries going to every part of the body. The arteries, as they narrow, are connected to smaller vessels called capillaries. In these capillaries, oxygen and nutrients are released from the blood into the cells, and cellular wastes are collected for the return trip. The capillaries then connect to veins, which return the blood back to the heart. Living a “heart-healthy lifestyle” is the best way of preventing and controlling vascular disease: do not smoke; eat nutritious foods low in fat; exercise; maintain a healthy weight; and control risk factors such as high blood pressure, high cholesterol, diabetes, hypertension, and other factors that contribute to vascular disease. The patient should discuss risks with their surgeon after careful review of the patient’s medical history and a physical examination.